Sporting the same high level of compression as the Run Sock 2.0, the Calf Sleeves 2.0 match perfectly with your favorite pair of CEP socks. 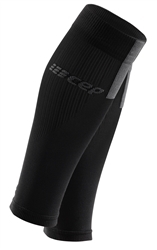 CEP Calf Sleeves give you more energy for greater endurance and enhanced performance for all types of sports. They feature medi compression, which improves circulation, reduces the muscle vibrations that frequently cause sore muscles, and increases coordination. This has the overall effect of helping prevent injuries while noticeably improving your sense of motion. CEP Calf Sleeves are the perfect way to combine compression technology with your favourite CEP socks.